Thanksgiving is almost here! When we first started our own healthy eating journey, we would always indulge on Thanksgiving (and you still should – no guilty feelings here)! However, the one thing we noticed was how bad our stomachs would feel. One year, David was actually in pain! We are always down for a good indulgence, but not pain. 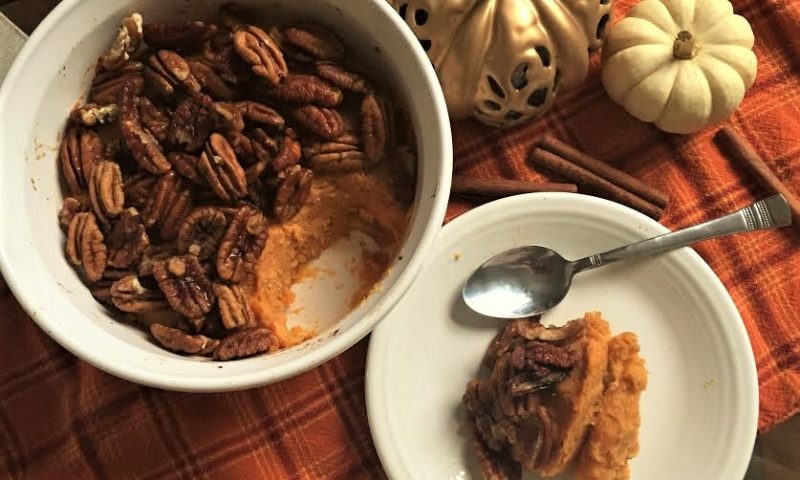 So once we started eating plant-based, we challenged ourselves to make delicious Thanksgiving treats that were still an indulgence and tasted delicious, but wouldn’t impact how we physically felt afterward. The result was a whole Holiday Guide where we share many of our favorite holiday cookies and pies! You can get your copy below! Today though, we are sharing a few featured recipes from the Holiday Guide and nutrition plan to help you get started! And we swear, your family won’t know they are cleaner and healthier for your body, so indulge away! Preheat oven to 350 degrees F. In a food processor, prepare the crust. Blend together the oats, almond flour, dates, flax egg, and water. You will need to blend for a couple of minutes, and continue until the crust comes together into a sticky dough. 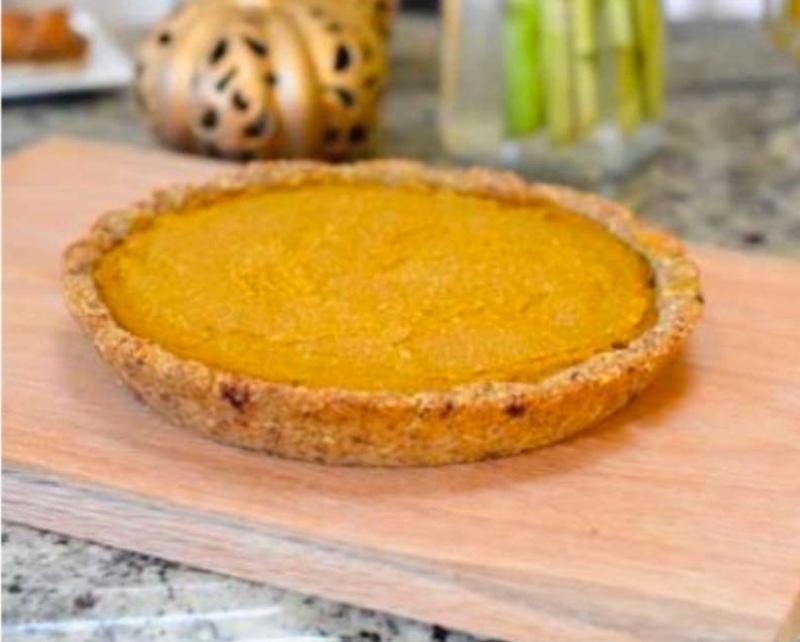 Lightly spray a pie plate, and using your fingers, press the crust into the pie plate. Keep pressing and forming the crust around the pie plate until it is fully covered. Set aside. In the food processor (no need to clean it out), blend together all of the filling ingredients until smooth. Once smooth, pour filling into the pie plate, over the crust. Bake in the oven for 20-30 minutes, or until the center of the pie has set and the pie is no longer jiggling. Let the pie cool completely before serving. Serve plain or whip up some chilled, full fat coconut milk as a cream topping, or simply use a dollop of coconut cream (coconut cream can be found in Asian foods section of grocery store). *Optional, if you would like the marshmallow topping, you can buy vegan marshmallows at the store! We do this as an extra tasty treat! Peel and cube sweet potatoes and then place in a large pot of water. Bring the pot of water to a boil. Once boiling, cook potatoes for another 10-15 minutes, or until the potatoes can easily be pierced with a fork. Once ready, drain and mash the potatoes. Mix in the remaining filling ingredients, and taste and add a pinch more of seasonings or maple syrup if needed. Meanwhile, preheat the oven to 350 degrees F, and lightly grease an 8-inch casserole dish. Set aside. In another bowl, mix together all of the topping ingredients. Spoon the sweet potato mixture into the casserole dish, and then evenly spread the topping mixture over the top of the sweet potatoes. 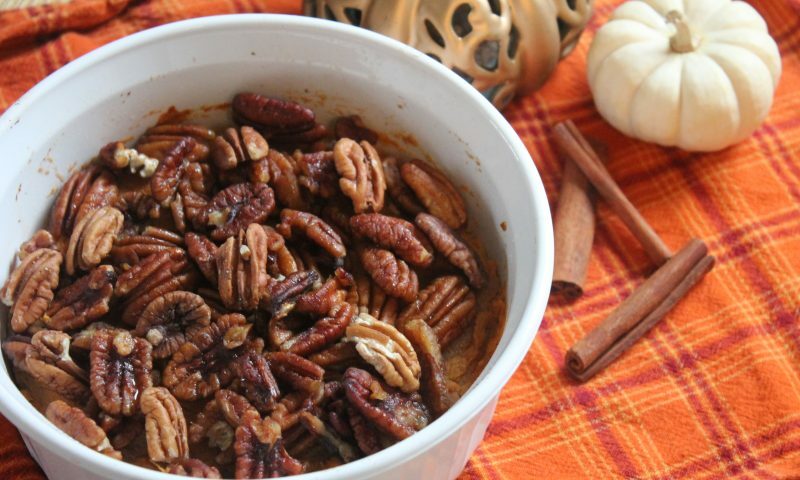 Place casserole dish in the preheated oven and bake for 15-20 minutes, or until the pecans are more browned. Pour water and cranberries into a pot and bring to a boil. The cranberries will start to pop – that is good! If needed, add up to a 1⁄2 cup more of water and continue to let the berries simmer until they are all popping and breaking down (about 5-10 minutes). 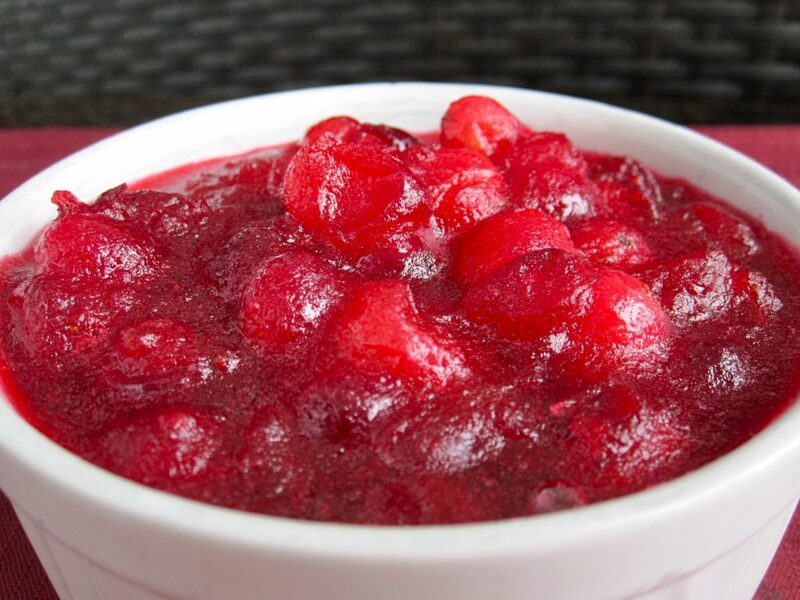 Use a potato masher to help crush the cranberries a little more, depending on your desired consistency. Mix in the cinnamon stick and honey and orange zest and juice, and continue to simmer for up to 10 minutes. Remove from heat and mix in orange liquor and spices, if using. Pour into jars or ramekins (you will need 3-4 of them) and let chill for about 15-30 minutes. Then wrap and refrigerate to let the sauce firm up even more. Option: If you do not want any chunks in your sauce, you can push all of the cranberries through a sieve before storing in the refrigerator. If you would like to do the cinnamon-sugar rim, simply mix together equal parts of coconut sugar and cinnamon in a dish. Pour a little water into a separate dish, and dip the top of two champagne flutes into the water. Then, dip the flutes into the cinnamon-sugar mixture. Next, fill the flutes just under halfway with apple cider. Top each glass off with champagne, and enjoy! 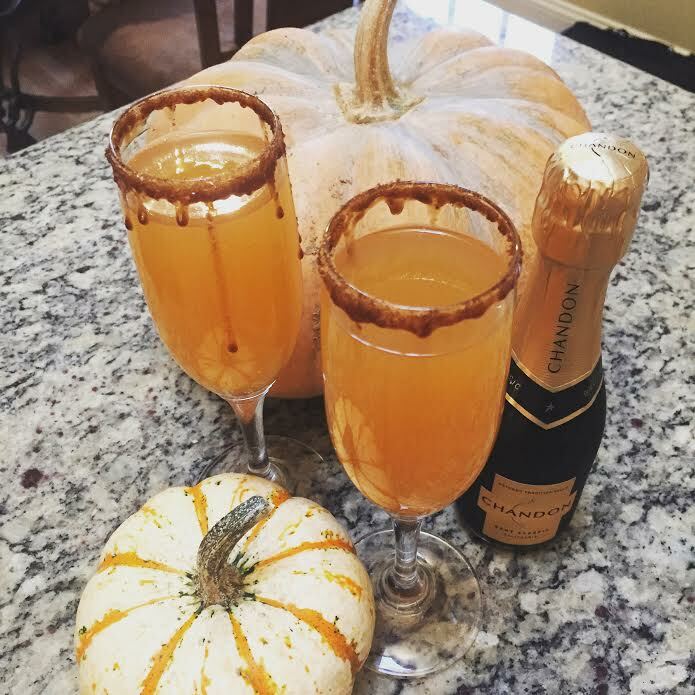 This is a very simple twist on a regular mimosa that you can enjoy this fall and holiday season. If you want more delicious holiday recipes, you can purchase the Full-Length Nutrition Plan where you will receive lifetime access to everything, or just purchase the holiday guide below. Please note, only full-length plan members will continue to receive updates and new plans for free!